Fig. 1. 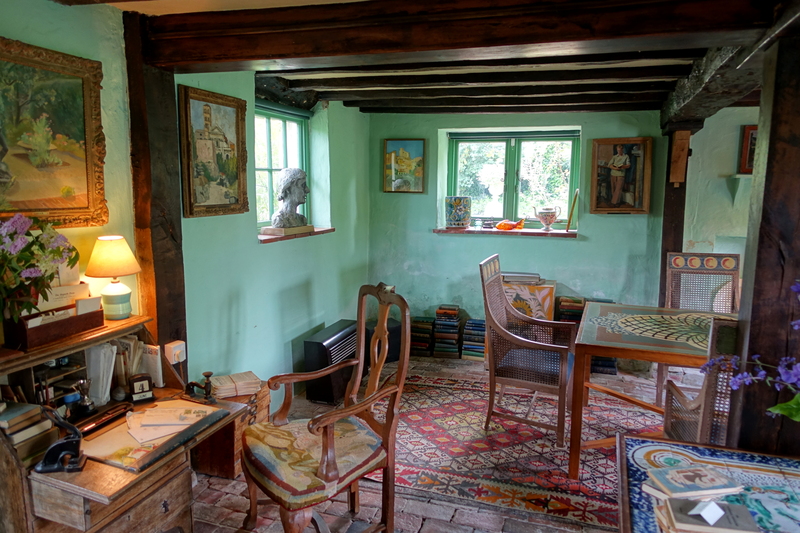 Virginia Woolf's sitting room at Monk's House, East Sussex, one exemplary space of modernist production and collaboration. Courtesy Wikimedia Commons. The future of the digital humanities is field-specific. Past models of the digital humanities (DH) have emphasized interdisciplinarity—not, perhaps, so much the idealized version of interdisciplinarity that implies a fertilizing combination of disciplines and their existing, unique methods as the strategic development and deployment of new, shareable methods that could (at least theoretically) apply to any number of humanist disciplines or literary subfields. Reaching across disciplinary boundaries was necessary, on a practical level, in order to assemble a sufficient number of peers performing the everyday activities of scholarship (collaboration, mentorship, peer review, critique) for a robust new field to emerge. The 2011 annual conference of the Alliance of Digital Humanities Organizations (ADHO), titled “Big Tent Digital Humanities,” provided a key figurative touchstone for those defining the field at a moment when increased attention to the digital humanities seemed to demand a plethora of definitional manifestoes, ones that invariably attempting to adopt a discipline-neutral position to account for digital scholarship and pedagogy in the humanities at large. William Pannapacker’s widely read and widely cited set of blog posts for the Chronicle of Higher Education on the topic from 2008–2011 provided an outsider’s perspective for those not familiar with the field. Meanwhile, DH specialists churned out “What is DH?” blog posts, articles, monographs, and (in particular) edited collections, most notably Susan Schreibman, Ray Siemens, and John Unsworth’s A Companion to Digital Humanities (2004) and Matthew K. Gold’s Debates in the Digital Humanities (2012). That fact that both collections have been recently updated—Schreibman, Siemens, and Unsworth issued a New Companion in 2016, while Lauren Klein joined Gold to edit Debates in the Digital Humanities 2016—suggests that there is still interest in representing the digital humanities as a “big tent” operation. And the ever-lengthening tables of contents in such volumes seem to indicate an unchecked impulse to develop DH by stretching the canvas over more and more disciplines, even though compelling arguments have been lodged against the feasibility and desirability of the big tent. But unlike the rise of transnational modernist studies—which itself can be seen as “big tent” modernism in that it argues that modernism has occurred (and continues to occur) beyond its traditional spatial and temporal boundaries—DH’s expansion is perhaps less the fruit of century-long tensions about disciplinary definitions than a rhetorical device for establishing DH’s right to be funded and recognized in institutions of higher education. And despite the challenges made to the big tent metaphor, as Gold and Klein note in their introduction to their 2016 collection, “it has not yet been replaced by any of the ‘alternate structuring devices’ that have been proposed.” To be fair, edited collections like these cannot, perhaps, do otherwise than continue to erect and tend the big tent, even as they critique it. The contributors’ wide distribution across humanities fields tends to privilege the production of position papers, methodological statements, and instruction sets: the kind of work that seems relevant for any humanities scholar. Granted, the usual suspects on these tables of contents are generally receptive to change and critique, and their work often cannily acknowledges the gap between the specificities of one’s particular DH tool or project and the generalities of arguments about DH as a field. The latter are implicitly understood to develop out of the former, but to make these relations explicit, smaller tents are required. For modernist scholars, a smaller tent not only responds to our existing research and teaching interests, but also quickly suggests a number of “alternate structuring devices” whose absence Gold and Klein lament. To take, again, transnational modernism, as an example, this temporal and spatial expansion of modernism enfolds a number of methods, such as the historicism of Laura Doyle and Laura Winkiel’s Geomodernisms, the formalism of Urmila Seshagiri’s Race and the Modernist Imagination and Jahan Ramazani’s Transnational Poetics, the Marxism of Peter Kalliney’s Modernism in a Global Context, or the ethics of Jessica Berman’s Modernist Commitments. Amid this diversity, modernist scholars are well aware of the necessity to cultivate methodological pluralism to reap the benefits of deep, focused training while erecting bigger tents. The usefulness of modernist training has become more evident as DH scholars trained in literature have begun to erect these smaller tents, sized to stretch only across literary periods. The founding of the MLA’s Literary Studies in the Digital Age: An Evolving Anthology in 2013 and the journal Digital Literary Studies in 2015 (whose editor-in-chief and many of its Advisory Board members are modernists) reflect a confidence in an increased and increasing market for literature-based DH. Modernist scholar Adam Hammond’s Literature in the Digital Age: An Introduction (2016) attempts to enfold into this community even those “scholars and students trained in print-based approaches” who do not immediately plan on spearheading their own DH research but nonetheless want to “be able to talk to those steeped in the digital.” Such publications show the promise of future investments in discipline-specific DH, including new digital literary scholarship that is self-consciously rooted in individual fields: that is, aimed at and responding to the smaller communities of scholarly practice around which the bulk of our research and teaching revolves. Some early work about modernism and the digital humanities was contextualized as an issue for media studies scholars, including Maria Engberg and Jay David Bolter’s “Digital Literature and the Modernist Problem” and Jessica Pressman’s Digital Modernism: Making It New in New Media (2013). Engberg and Bolter’s piece was written to connect the field of electronic literature (that is, contemporary literature that is born digital and/or focuses on interrogating digital cultures) to debates in modernist literary criticism since the 1980s regarding the political efficacy of avant-garde moments after World War II. Pressman’s book also relates electronic literature to the era of literary modernism as she traces a genealogy by which the rise of media studies (via Marshall McLuhan) temporally bridges these two (superficially) separate historical movements. Both of these works reveal how both modernist scholarship and modernist literature are of central concern to media studies and electronic literature, yet they also show that much of the scholarship explicitly about modernism and digital cultures in the first two decades of the twenty-first century was not directed specifically to modernist critics. Only recently has work been pitched directly to a specialist modernist audience, including Stephen Ross and Jentery Sayers’s “Modernism Meets Digital Humanities” (2014) and the “Visualizing Periodical Networks” special issue of The Journal of Modern Periodical Studies (2014, guest edited by J. Stephen Murphy and including the work of Jeffrey Drouin, Chatham Ewing, Mark Gaipa, Gabriel Hankins, and Clifford Wulfman). Ross and Sayers characterize modernist digital literary studies as in its infancy, citing copyright restrictions and a paucity of digital archives of modernist works as reasons for the inability thus far of digital humanities to intervene profoundly in modernist studies. For Ross and Sayers, the prominence of initiatives like the Modernist Journals Projects obscures the need to go beyond making digital editions and engage in truly multimodal digital scholarship. “Visualizing Periodical Networks” asserts the power of digital tools to recover and analyze the deep and far-flung social and publishing networks from which little magazines emerged. They offer the coterie as not only the true signature form of modernism, but also as an object of inquiry that requires digital tools and methods as a supplement to biography, close reading, cultural materialism, archival research, and literary theory. Still more recently, Claire Battershill et. al’s Scholarly Adventures in Digital Humanities: Making the Modernist Archives Publishing Project (2017) agrees that modernist scholars should pursue DH by tracing networks of literary production. The book’s experimental, reflective chapters place collaboration at the heart of both modernist scholarship and modernism itself. By contrast, Reading Modernism with Machines (2016), a collection I coedited with James O’Sullivan, follows Ross and Sayers’s line of thought, gathering multimodal forms of modernist research into a single volume to demonstrate the range of interventions DH methods may make in existing conversations in modernist studies (such as the role of Cambridge women’s colleges in shaping feminist social networks, the etymological richness of James Joyce’s Ulysses, the number of speakers in T. S. Eliot’s The Waste Land, and the relationship between “high” and “low” art in periodical cultures). Putting these two strands of inquiry together reveals the future shape of work in modernist DH: applying digital tools and methods to analyze modernism as a set of material, institutional, and collaborative practices of production, distribution, and consumption, and to understand how these physical and human networks are recapitulated by modernist DH scholars themselves. This recapitulation is neither symbolic nor anachronistic. It is not based in claims that affective or philosophical responses to changing technologies are the same then and now; it is not based in claims that DH scholars produce formally avant-garde productions in ways that can be productively compared to modernist stylistic challenges to realism and empiricism. Rather, it is based on common practices of reading, writing, and publication that manipulate emergent technologies and emphasize collaboration. And it is based on concerns that have long shaped modernist studies, rather than on concerns within DH in general. This kind of field-specific research releases modernist scholars from a particular pitfall that Bethany Nowviskie argues is common for DH scholars: the pressure to subordinate sub-disciplinary research in favor of acquiring and teaching digital skills to new crops of students and junior faculty arriving each fall. She memorably terms this pitfall the “eternal September,” a pattern by which scholars who wish to pursue digital projects are gradually led away from “personal research agendas—the very things that . . . fe[el] too self-indulgent to be borne.” Though Nowviskie compellingly characterizes the struggles felt by many DH faculty and staff (again, many of whom are trained in modernism) whose remits include outreach efforts, modernist scholars must resist this subordination. “Personal research agendas” are not distractions. A specifically modernist DH, like that seen in the pieces of this cluster, reinscribes such indulgence as a powerful mode of DH scholarship that best suited to intervening in ongoing debates in modernist scholarship, not insularly revolving around debates about DH qua DH. That we are still operating within particular literary periods and “traditions” is appropriately a cause of concern for the new modernist studies, which resists narrow spatial, temporal, and formal definitions of modernism. But placing these two principles side by side—that the boundaries of modernism have rightly been expanded and the specialized knowledges and agendas of DH practitioners often attenuate in order to advance digital projects, tools, and platforms that are of use to academic humanists at large—shows that the former models a solution for the latter. Modernist scholars should focus on modernist DH initiatives whenever possible, and they should use DH techniques to interrogate the boundaries of modernism and intervene in modernist-specific debates. Each new digital edition, archive, or interactive installation, far from being regarded as neutral, advances an argument about modernism. Being self-reflexive about the persuasive power of digital formats will allow modernist DH practitioners to ensure not just that the content of their digital projects is related to modernism (and thus draws on their training and furthers their own research), but also that their project design and management, their coding and encoding, are consciously shaped to be, in themselves, a form of modernist scholarship. The contributors to this cluster are experienced in these efforts. Their arguments are deliberately rooted in their concrete experiences with modernist digital humanities projects, such as the Modernist Journals Project (MJP), Linked Modernisms (LiMo), Modernist Networks (ModNets), and the Modernist Archives Publishing Project (MAPP). In addition, Claire Battershill, Adam Hammond, Gabriel Hankins, Helen Southworth, Alice Staveley, and Elizabeth Willson Gordon, are contributors to recent DH publications named above, emphasizing the degree to which modernist scholars have contributed to the spread of DH and are now best served by forums in which a certain level of specialist knowledge can be assumed. In forums like this, authors can productively pursue research questions that are entirely necessary for showing modernist scholars why digital scholarship is worth investing in. As the title of this cluster suggests, we are not going from theory to practice; doing so would perpetuate a model of digital projects as byproducts of scholarly work focused on defining DH and encouraging skills acquisition in an interdisciplinary context. Instead, to forge an immanent theory of digital modernism, this cluster moves from practice to theory, basing its big ideas on past particular experiences with digital projects, particular digital methodologies, and on literary critical practices already underpinning and motivating modernist studies. This is why this cluster opens with Gabriel Hankins’s “We Are All Digital Modernists Now,” which acknowledges that even at the scale of the everyday—inhering in our research, communication, and teaching practices—we have little choice but to be digital. Hankins’s exhaustive catalogue of the digital labors that modernist scholars engage in as researchers and teachers reveals the ways in which we have ignored, deemphasized, or even erased the traces of our digital work in the process of research. Hankins provides the first of many accounts in this cluster that explore the collaborative, social nature of our digital labors. Hankins’s ultimate recommendation that we seek even more precise terms to characterize our particular approaches—that even smaller tents than “digital modernism” are erected—suggests that, just as we insist that the term modernisms more accurately describes our object of study, we need to insist on exploring digital modernisms. In the process of reflecting on two decades of the scholarly labors that have made the MJP an indispensable open-access tool, Jeffrey Drouin and Sean Latham provide in their concept of “medium data” an example of one such smaller tent within digital modernism. Medium data, they explain, is not simply a concept that developed as an aftereffect of the MJP, but indeed a practice of reading and research that is embedded in and encouraged by the very structure of the digital resource. Its essays, resources, images, PDFs, search functions, and interactive components are not neutral, passive tools that may help scholars develop theories of modernism; rather, these rich digital features embody the theories of modernism implicit in the MJP. Drouin and Latham thus suggest possible futures for modernist studies by looking backward: if the MJP’s inclusive model of modernism anticipated the fundamental tenets of what we now call the New Modernist Studies, then we might analyze digital tools under production now for signs of future currents in modernist studies. One such new project is the subject of “Collaborative Modernisms, Digital Humanities, and Feminist Practice,” by Claire Battershill, Helen Southworth, Alice Staveley, and Elizabeth Willson Gordon. MAPP, which uses digital tools to unearth the editorial and labor practices of small presses and to examine the life-cycle of modernist texts as they are offered contracts, published, circulated, and republished. Using their experiences with MAPP, Battershill et. al propose that the future of modernist digital humanities is feminist and collaborative. To recover new feminist histories of modernism, they argue, just as modernists who wanted to run presses had to learn how to operate presses and keep accounts, we too must learn new (digital) technologies. By drawing these parallels between the working conditions of modernist presses and those of contemporary digital tool-making, Battershill and her colleagues reveal that collaborative processes are not only part of MAPP’s content and a necessary condition of its creation, but also move from practice to theory by generating a new subject for future scholarship. Further benefits of scholarly collaboration inform “From Parallax to Praxis: A Seven Sided Paper on Dynamic Web Ontologies and Modernist Studies,” by Jana Millar Usiskin, Christine Walde, and Caroline Winter. Like MAPP, the Linked Modernisms in which these authors participate uses carefully structured collections of data to reveal new facets of modernists’ personal and professional relationships and theorizes the degree to which these data structures reflect both modernists’ aesthetic practices and DH tool-making practices. Millar Usiskin, Walde, and Winter’s experimentally-structured essay develops the concept of the parallax and of the rhizome as figures for both modernist epistemologies and digital ontologies. Yielding a modernism that is plural and fluid, their model echoes current insistence on multiple “modernisms,” yet enriches this now-familiar theorization by showing how these multiplicities can be mobilized in our scholarship via digital scholarly communication and editing. Modernist scholars can explicitly encode the avant-garde’s uncertainties, fragmentations, and disruptions within the informational structures of digital projects, thereby creating a feedback loop between content and code in which theories of information are shared by authors and coders. Nikolaus Wasmoen’s “Editing Modernism’s ‘Unassailable Data’: Models for Unauthorized Interpretation” also champions multiplicity over singularity, revealing how crafting new practices of digital editing and project construction can better allow a plurality of modernisms to proliferate in the digital realm. Like the other contributors, Wasmoen theorizes a new model of modernist artistic production that began to emerge during the process of interacting with and creating digital resources. He foregrounds the figure of the editor as a figure of rival importance to the author. In his investigations of Dora Marsden and Ezra Pound’s editorial exchanges, which are juxtaposed with readings of ModNets and other digital modernist projects, Wasmoen establishes the editor as a transformative figure applicable both to modernist little magazine editors and to the coders, encoders, managers, and directors of digital modernist platforms and resources. This piece substantiates Hankins’s claims about the ability of DH projects to embody principles of the new modernist studies; and in ModNets, it suggests a source for future reformulations of the figure of the scholarly editor. The contrarian or rebellious spirit of Wasmoen’s piece also animates Adam Hammond’s “From Modernism to moDernIYsm: Reading Modernism Through the DIY Ethic of Punk, Riot Grrrl, and Indie Videogames,” which links gaming, electronic literature, and modernism to suggest new avenues for redefining and teaching modernism in the twenty-first century. In his comparisons of contemporary independent video games to the little magazines of modernist artistic production, Hammond isolates trends and strategies that are equally descriptive of the collaborative DIY ethic of the digital projects mentioned in the previous contributions. He therefore provides a chronological missing link of artistic production that bridges early-twentieth-century modernism with early twenty-first century DH projects. These material correspondences between the labors of digital humanists and those of modernists artists themselves—for both they and we make use of new technologies to disseminate modernist literature and advance particular definitions of modernism and critiques of modernity and modernization—suggest that what David James and Urmila Seshagiri call “metamodernism” may also be understood as contemporary practice of modernist scholars who use methods from the digital humanities. All six contributors emphasize the production of modernism and digital tools. All note the continuities of the creative processes of collaboration, editing, organizing, and publication common to modernism and the digital humanities. Modernisms are multiple, plural, transactional, and collaborative—as are the DH projects devoted to them. These six pieces suggest that the future of modernist digital humanities is rooted in digital practices that record and recapitulate modernisms’ own patterns of creation. Ultimately, these six pieces demonstrate how modernist scholars can forge, out of close contact with a particular discipline and the digital humanities, field-specific methods and concepts that promise not only to change the way we approach scholarly research, communication, and teaching, but also to drive new definitions of foundational disciplinary concepts of modernism and modernity. Effective cultures of modernist digital practice—collections of shared norms governing digital research, scholarship, and resource creation—must make use of the kind of thoughtful interaction modeled in these six metamodernist manifestoes between the theoretical and methodological affordances of the digital humanities, on the one hand, and on the other, the deep knowledges and particular preoccupations of disciplinary specializations. This is the promise of our particular moment in modernist digital literary studies, when we are poised to craft digital work that consciously embodies the aesthetic and philosophical principles of modernism and uses its new formats to forge and spread new scholarly arguments about modernism. In other words, for modernist scholars to make it new in the digital humanities, we must make it truly modernist. William Pannapacker’s editorials, all published in the Chronicle of Higher Education, include “‘Big Tent Digital Humanities,’ a View from the Edge, Part 1,” last modified July 31, 2011; “The MLA and the Digital Humanities,” last modified December 28, 2009; “Pannapacker at MLA: Digital Humanities Triumphant?” last modified January 8, 2011; and “Summer Camp for Digital Humanists,” last modified June 27, 2008. Debates in the Digital Humanities, ed. Matthew K. Gold (Minneapolis: University of Minnesota Press, 2012); A Companion to Digital Humanities, ed. Susan Schreibman, Ray Siemens, and John Unsworth (Malden, MA: Blackwell, 2004). A New Companion to Digital Humanities, ed. Susan Schreibman, Ray Siemens, and John Unsworth (Malden, MA: John Wiley & Sons, 2016); Debates in the Digital Humanities 2016, ed. Matthew K. Gold and Lauren F. Klein (Minneapolis: University of Minnesota Press, 2016). Lauren F. Klein and Matthew K. Gold, “Digital Humanities: The Expanded Field,” in Debates in the Digital Humanities 2016, ix–xv, x.
 Laura Doyle and Laura Winkiel, eds, Geomodernisms: Race, Modernism, Modernity (Bloomington: Indiana University Press, 2005); Urmila Seshagiri, Race and the Modernist Imagination (Ithaca, NY: Cornell University Press, 2010); Jahan Ramazani, Transnational Poetics (Chicago, IL: University of Chicago Press, 2009); Peter Kalliney, Modernism in a Global Context (London: Bloomsbury Academic, 2015); Jessica Berman, Modernist Commitments: Ethics, Politics, and Transnational Modernism (New York: Columbia University Press, 2012). Literary Studies in the Digital Age: An Evolving Anthology, ed. Kenneth M. Price and Ray Siemens (New York: MLA Commons, 2013). Adam Hammond, Literature in the Digital Age: An Introduction (New York: Cambridge University Press, 2016), xvi. See Maria Engberg and Jay David Bolter, “Digital Literature and the Modernist Problem,” Digital Humanities Quarterly 5, no. 3 (2011); Jessica Pressman, Digital Modernism: Making It New in New Media (Oxford: Oxford University Press, 2014). These debates are best summarized in Peter Bürger, The Theory of the Avant-Garde (Minneapolis: University of Minnesota Press, 1984). See Stephen Ross and Jentery Sayers, “Modernism Meets Digital Humanities,” Literature Compass 11, no. 9 (2014): 625–33. Claire Battershill et. al., Scholarly Adventures in Digital Humanities: Making the Modernist Archives Publishing Project (Cham, Switzerland: Springer Nature, 2017); Shawna Ross and James O’Sullivan, Reading Modernism with Machines: Digital Humanities and Modernist Literature (London: Palgrave Macmillan, 2016). Bethany Nowviskie, “Eternal September of the Digital Humanities,” last modified October 15, 2010.